Warning: Don't read this review if you haven't read the first two books in the Divergent series beforehand! 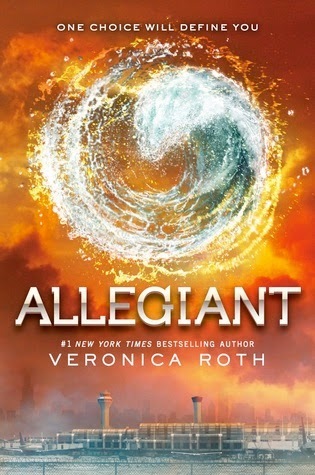 I loved the first two books in the Divergent series, and I'd been counting down until the release of Allegiant – the final book in Veronica Roth’s bestselling dystopian trilogy. Unfortunately, however, I was disappointed. It’s hard to explain why without giving too much away, but I found that Allegiant had a completely different tone to its predecessors. It was in fact so different, and so unsatisfying, that I truly struggled with the first 80% of the novel. I found the events boring, frustrating, and far too removed from the dystopian society which I'd come to know and love. By the time Allegiant reached its climax, I’d developed a sort of indifference to everything that was going on, and I even found it difficult to remember why I had loved the characters so much in the previous instalments. It felt as if my reactions had been watered down, and all I could think was, ‘huh’, although I really wanted to care more. I even met that controversial bit which has many Divergent fans throwing tear drenched tissues into bins and cursing at Veronica Roth with a surprising degree of apathy. So, overall, I found Allegiant to be an anticlimactic end to an otherwise superb series. At some point, I might go back and read all three books simultaneously, just to see if it makes a difference. For now, though, this will have to do.